Birch – Shadow of the Cat is book 2 in the Birch Trilogy. Fifty years of peace has cast a mirage of safety over the lands of Modania. Lord Zelfen, stripped of his power and imprisoned after bringing terrible war to the world, becomes a distant memory for those who endured his dominion. For many, tales of war are merely stories told by the old to scare the young. But in the woods of the world, mysterious guardians with unbelievable magical powers watch and wait for the inevitable return of war. For Aluen, the skinny son of a blacksmith, magic has always captured his imagination. Tired of petty trickery and dull illusions, when he hears of a mystic fair visiting nearby, he jumps at the opportunity to see some real magic. Befriending another traveller on the journey there, he soon finds himself increasingly involved in a world much bigger, stranger and darker than the quiet life he left behind. When Lord Zelfen tricks his way out of the prison known as The Watch, his terrible dominion once again threatens the lives of everyone in Modania. Aluen finds himself swept into danger and together they seek the help of the guardians known only as Birch and Timber Cat in a quest to stop Zelfen’s terrible vengeance. 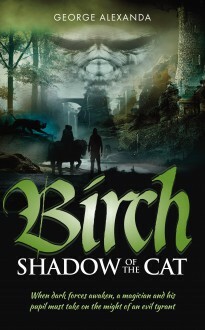 Birch – Shadow of the Cat is set in an immersive fantasy world of dangerous magic, incredible creatures and intricate plots for peace and power. Fast-paced action and enthralling visions of another world make it an exciting read.